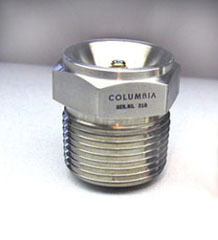 The Columbia Series 939 High Intensity Acoustic Sensor (Microphone) is designed for the measurement of gas-borne sound in the frequency range of 2 Hz to 15KHz in industrial applications requiring operation up to +500 Degrees Fahrenheit. These units are constructed for use in corrosive environments which are compatible with the type 316 stainless steel diaphragm. The miniature 10-32 fused-glass coaxial connector combined with the all-welded construction provides a true hermetic seal. Electrically, the Series 939 transducers comprise sensing elements of piezoceramic material, the low side of which are electrically common with the stainless steel housing. Consult the factory for customized versions of this sensor.